The Centre for Musculoskeletal Health and Work was launched in February 2015 to identify ways to minimise the impact of musculoskeletal disorders (MSDs) at work. Director of the centre, Professor David Coggon, answers questions about how the development is progressing. The centre is jointly funded by Arthritis Research UK and the Medical Research Council. There is also some financial input from the institutions that the members of the centre are based at, mainly covering their salaries and the fees of PhD students. Some of the centre’s research projects are additionally supported from other sources (eg the Colt Foundation and the Economic and Social Science Research Council). What are the centre’s objectives? The overarching objective is to find cost-effective ways of minimising the adverse impacts of MSDs in the workplace, with benefits for patients, workers, employers and society at large. A secondary aim is to develop capacity in this field of research through high-quality training for PhD students and post doctoral fellows from various relevant disciplines. It is also intended that the centre should become a national resource for advice on MSDs and be accessible to all stakeholders, The centre should actively promote best practice. What are the likely outcomes of the research? The research undertaken by the centre addresses a range of questions. Some are of immediate practical relevance, eg should people with non-specific pain in the forearm, wrist or hand (including repetitive strain injuries) be advised to rest the arm, or to maintain their normal activities insofar as their symptoms allow? Or, what are the risks from undertaking heavy manual work following hip- or knee replacement surgery? Others will inform the design of future research, eg how can we best quantify the costs to employers of impaired performance of employees with health problems, who manage to remain at work but are less than fully fit? 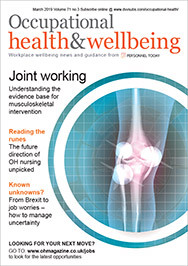 It has four main themes: back, neck and upper limb disorders; osteoarthritis and employment; inflammatory arthritis and employment; and the inter-relation of musculoskeletal health and work for older employees. Within these areas, some studies relate to primary prevention of illness, while others are concerned with minimising the occupational impacts of illness when it occurs. What form will the research take? The methods of research will be those that can best address the identified study questions. They include randomised controlled trials, cohort and cross-sectional epidemiological studies, analyses of published statistical data and qualitative investigations. What is the timescale for publishing it? advanced stage when it was first established, and new papers based on those studies are now being presented at conferences and submitted for publication. Other studies are just beginning, and, depending on their design, may not produce published results for a few years. How do you anticipate the research will be used to inform practice in the workplace and health service? The research questions have all been chosen with a view to practical application, either directly or through further follow-on investigations. Applications may lie in: employment practice, eg how can employers communicate most effectively with health professionals to prevent unnecessary incapacity for work? ; clinical practice, eg how soon should patients be advised to return to work after carpal tunnel surgery? ; and government policy, eg how much emphasis should be given to ergonomics in the prevention of common MSDs? Will there be guidance relating to both prevention and rehabilitation? One of the outputs from the centre’s work will be practical guidance for stakeholder groups (employers, clinicians and patients/workers), which is likely to cover both prevention and rehabilitation. Who will be working with or for the centre, and who will undertake the research? The centre comprises senior researchers from eight institutions (the Universities of Aberdeen, Lancaster, Manchester, Salford, Liverpool and Oxford, Imperial College and Guys and St Thomas’s NHS Trust) led by a coordinating team at the University of Southampton. These senior researchers come from a variety of scientific disciplines, including: rheumatology; occupational medicine; physiotherapy; occupational therapy; epidemiology; health economics; medical statistics; and psychology. Operating in teams, they will lead the various research projects, in some cases working also with external collaborators (both from the UK and abroad). Under the guidance of the project leaders, much of the day-to-day execution of projects will be undertaken by PhD students and postdoctoral fellows, and this will help us meet our secondary objective of building research capacity. How will the findings be disseminated? Findings will be distributed through presentations at meetings, published papers, summaries on the centre’s website, guidance notes and responses to consultations. How does the research relate to public health policy and government initiatives such as the fit note and the Fit for Work service? The research that the centre conducts must be relevant to policy and clinical practice in the UK, and its work on the management of incapacity for work needs to take account of the fit note and Fit for Work service. One of the centre’s projects will focus specifically on communication between employers and healthcare professionals, looking at ways in which the fit note might be used more effectively. How will the centre keep abreast of new developments in the field? Between them, the senior scientists in the centre are well networked, having links with government departments, employers, other organisations with an interest in employment and health, practising occupational physicians, clinicians in the health service, and other researchers in occupational health. In addition, the centre will be assisted by advice from an international scientific advisory board, and from a stakeholder group including representatives from government, industry and workers. David Coggon is a professor of occupational and environmental medicine at the University of Southampton, and director of the Centre for Musculoskeletal Health and Work.